Lawmakers will meet to discuss H.R. 4158, a bill to "confirm full ownership rights" for certain U.S. astronauts to space artifacts. Update for August 1: The committee's markup of this bill has been postponed. A new date has not yet been set. The U.S. House of Representatives will begin considering a bill this week to confirm the ownership of astronauts' mission mementos. The lawmakers' meeting comes 41 years after astronauts landed on the moon with souvenirs that raised congressional concerns. The House Committee on Science, Space and Technology is scheduled to meet Thursday (Aug. 2) to markup the bill, which is aimed at establishing clear title to the space artifacts that astronauts have kept since flying to the moon. The bill (H.R. 4158) takes an almost opposite approach to the outcome of a congressional investigation held after the Apollo 15 mission, which accomplished the fourth manned moon landing in July 1971. Four decades ago, NASA — in response to pressure by Congress — formalized rules that restricted the types of souvenirs that space-bound crews could fly and keep from their missions. "From the beginning of our nation's space program through the Apollo era, NASA astronauts were permitted to retain mementos from their spaceflights," Hall and Johnson said in a March 2 letter sent to committee members. "Without statutory clarification, some astronauts may be forced to make reparations." The bill, titled "To confirm full ownership rights for certain United States astronauts to artifacts from the astronauts' space missions," is, in its current form, only 264 words, or about one-fourth the length of this article. Thursday morning's markup is expected to be brief, as 32 out of the committee's 36 members are co-sponsors. In 1971, the Apollo 15 mission launched with what NASA later identified as "unauthorized" articles, including nearly 400 collectible postmarked envelopes, or postal "covers." The post-flight overseas sale of some of these mementos resulted in a congressional investigation and the Apollo 15 crew never flew in space again. The astronauts' moon-flown mementos were confiscated, and were only returned a decade later when the astronauts filed suit against the government, citing NASA's entrance into an agreement with the U.S. Postal Service to market covers to the public that were flown on the space shuttle. In July 2011, the government filed a lawsuit against Apollo 14 moonwalker Edgar Mitchell to have the motion picture camera he returned from the moon declared government property. After holding onto the camera for more than 40 years, Mitchell consigned it to an auction house in New York to be sold for an estimated $60,000 to $80,000. In court documents, Mitchell argued that he and his fellow Apollo astronauts had been given permission by NASA to save equipment as souvenirs if they were not intended to return to Earth. According to the Apollo 14 flight plan, had Mitchell not kept the camera, it would have crashed with the lunar lander, which was no longer needed at the end of the mission. But those early policies went mostly unwritten. It was not until decades later that NASA began to document its rules over the use of space shuttle equipment as mementos. Last October, Mitchell settled out of court, turning over the camera for its display at the Smithsonian National Air and Space Museum in Washington, D.C. In return, he was only responsible for his own legal fees. Then, this past January, NASA's General Counsel raised new questions over the title to artifacts offered by a Dallas auction house on behalf of Apollo 13 commander James Lovell and Apollo 9 spacewalker Rusty Schweickart. One item in particular, a lunar module activation checklist that had been used to reconfigure the lander into a lifeboat on the periled Apollo 13 mission, made headlines after it sold for a record-setting $388,375. NASA's inquiry halted that sale. Lovell, Schweickart and other Apollo astronauts came to Washington, D.C. to meet with NASA Administrator Charles Bolden, a former space shuttle astronaut, to try to resolve what the NASA chief described as "fundamental misunderstandings and unclear policies" regarding artifacts from the agency's Mercury, Gemini and Apollo programs. "We'll explore all policy, legislative, and other legal means to resolve these questions expeditiously," Bolden said at the time. "The agency will support whatever legislation comes from Congress," NASA spokesman Bob Jacobs said, in reply to the bill being introduced in the House last March. "This is in line with the discussion that the astronautshad with the administrator back in January." The bill applies only to artifacts held by U.S. astronauts "who participated in any of the Mercury, Gemini, or Apollo programs through the completion of the Apollo-Soyuz Test Project" in 1975. An artifact is defined as "any expendable item ... not expressly required to be returned to [NASA] at the completion of the mission and other expendable, disposable, or personal-use items." The bill, if left as is by the committee and then passed by both the full House of Representatives and U.S. Senate, would extend rights to more than just the artifacts that are currently in the astronauts' possession. 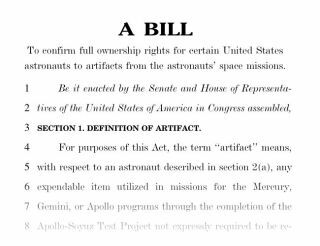 "The federal government shall have no claim or right to ownership, control or use of any artifact that subsequently was transferred, sold, or assigned to a third party by an astronaut," the bill reads. "Many of the astronauts have loaned, gifted, donated or sold artifacts to universities, museums, family members and private collectors during the intervening years," wrote Hall and Johnson.